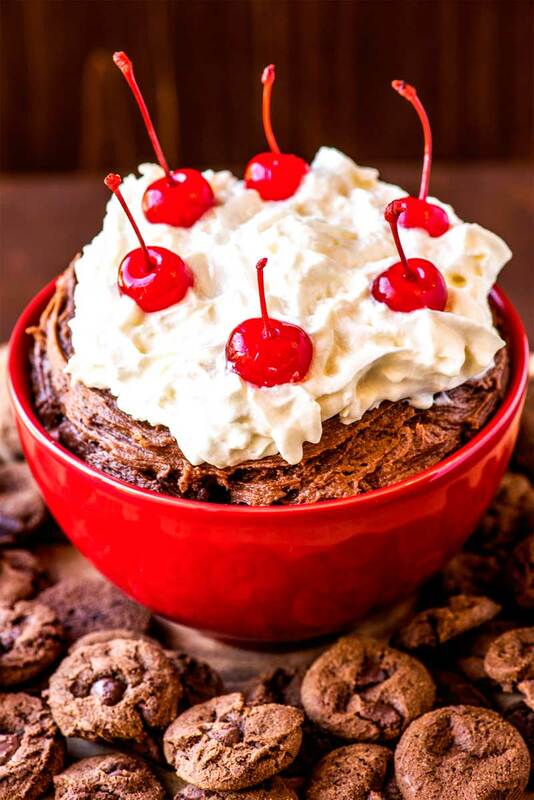 Get all the decadence of a black forest cake for a fraction of the effort with this dark chocolate cake dip that's layered with whipped cream and maraschino cherries. Make it yours by using your favorite chocolate cake mix as a base! Followers of this site know how much of a sucker I am for a good appetizer. And those same followers also know that it’s been far too long since I tried to get creative with my favorite type of appetizer: a dessert dip. So it was already on my to-do list to whip up some sweet treats, but what really brought this dip to live was an uncontrollable urge for chocolate cake. Which, okay, that’s a craving I tend to feel on a daily basis, but this past week it was so strong that I simply had to get in the kitchen and do something about it. And so, after raiding my cabinets to see what I had to work with, I found I had all the ingredients for a dark chocolate cake dip. So, that’s exactly what I made. Because when you can make black forest cake dip, you make black forest cake dip. As with any appetizer, you should keep track of how long it sits out at room temperature. For most foods, the general rule of thumb is that a perishable item should not be in the “danger zone” for more than two hours. And by “danger zone”, this is usually at or just above room temperature, which is how this dip will be served. One of the most common questions I get about dessert dips is whether or not you can make them in advance. I totally understand why someone would want to do this – it’s way easier to prepare treats for a party the night before than scrambling to get everything done the day of the event. For this dark chocolate dip, the ingredient you want to be careful of is the cake mix. Plus, the whipped cream used in this recipe won’t hold up that far in advance. When making this dip, you’ll notice that the consistency of the dip will change significantly once the milk is added to the dry mixes. That’s because adding the milk starts the process of the cake mix absorbing any available moisture. The idea is that this moisture will come from the milk. This means that the dip will continue to thicken a bit even after you’re done mixing. Because of this, if you plan to make this dip in advance, I recommend keeping an eye on the consistency before serving. If you find that it’s too thick, try adding anywhere from one to three tablespoons of milk. You’ll likely need access to a stand or hand mixer to get this done, so be sure that’s part of your plans. Also, hold off on completing any recipe steps involving whipped cream until you’re ready to serve the dip. Specifically, hold off on mixing the chopped cherries with whipped cream as well as decorating the top of the dip with whipped cream. Whipped cream is notorious for “melting” and “falling” over time, so for the best presentation and consistency, save these steps until just before it will be eaten. To refrigerate this dip: Add prepared dark chocolate chip dip to a bowl with a sealable lid. Secure lid and store in the refrigerator for up to two days. If you’ve already chopped the cherries, store them in a separate sealable container. Before serving, allow dip to soften a bit at room temperature. If dip seems too firm, try mixing a tablespoon of milk (up to a maximum of three tablespoons). To freeze this dip: Add prepared dip to a bowl with a sealable lid. Secure lid and store in the freezer for up to one month. Do not freeze cherries; just keep them in their jar in a cabinet until ready to use. Before serving, allow dip to unfreeze in the refrigerator for one to two days, then allow dip to soften at room temperature before serving. If dip seems too firm, try mixing a tablespoon of milk (up to a maximum of three tablespoons). What to serve with chocolate cake batter dip? After making as many dessert dips as I have, you start to get a feeling for what goes best with these ultra creamy treats. Below are some of my best suggestions. I personally feel this dip does best with mini chocolate chips, but any of the following options would be good, too! What type of chocolate cake mix should be used? You can be creative when picking a flavor of the chocolate cake mix, although you might be limited by what’s available at your local grocery store. To be true to black forest cake, it should be on the darker, richer side as opposed to milk chocolate. Can you use out of date cake mix? In case you’re anything like me, recipes like this strike you on days when you would prefer not to go out and you’re assaulting your cupboards for snack options. And, inevitably, you’ll stumble across something that looks fine yet has a date that’s expired. So, when it comes to expired cake mix, what do you do? Can you use it or not? First off, make sure that the cake mix has been properly stored. This means that it’s been in a cool, dry place, and that either the seal in still intact or that it’s been stored in a sealed container since it was opened. Once you confirm the storage, check the date printed on the package. Cake mix is typically good four to five months beyond the “best by” date. If you have a product that’s older than this, I would not recommend using it for something like a dip. If you’d like to read more about the concerns of expired cake mix, check out this article. Step 1 – In a small bowl, add some chopped maraschino cherries and some whipped cream, then give it a good stir. Use as much whipped cream as you like, but make sure the consistency says more on the creamy side than the fluffy side. Once mixed, set the bowl aside. Step 2 – Using a stand mixer (or hand mixer + large bowl), add cream cheese and butter. Whip them together on medium-high speed until ultra creamy. Step 3 – Stop the mixer and add in chocolate cake mix, powdered sugar, and milk. Turn the mixer back on, but be sure to start off on low speed; this will keep all the powdery ingredients from ending up on your counter. As the powder blends with the cream, slowly increase the mixer speed, getting up to medium. Mix until the dry and the cream ingredients are fully incorporated. Step 4 – Serve the dip by adding about 1/2 of the chocolate cake batter mix in a serving bowl of your choice. Create a well in the top of this layer, then pour the creamy cherry mix inside. Finish by scooping in the remaining 1/2 of the chocolate cake dip, then smooth out the top. Step 5 – Top the dip with a large helping of whipped cream, then decorate with a few stemmed cherries. Place the prepared bowl on a serving tray and surround with mini chocolate cookies for dipping. Separate out 4-6 cherries for decoration, then set them aside. For the remaining cherries, remove stems and cut them into 1/2 or 1/4. In a small bowl, add the chopped cherries. Spray some whipped cream into the bowl, then mix well. Feel free to add as much cream as you like, but be sure to mix it well so it isn't too fluffy. Set bowl nearby. Using a stand mixer (or a hand mixer + large bowl), beat cream cheese and butter on medium speed until fluffy, about 3-5 minutes. Stop mixer and dark chocolate cake mix, powdered sugar, and milk to bowl. Begin to mix again, starting out on low speed and gradually increasing to medium-high. Mix until dry ingredients are fully incorporated with the rest, about 5-7 minutes. Set dip aside. To serve dip: Add about 1/2 of the dark chocolate cake dip into a serving bowl of your choice. Create a small well in the top of the dip. Next, add the creamy cherry mix to the bowl. Top the cherry mix with the remaining dark chocolate cake dip, smoothing out the top. Spray more whipped cream on top of the dip and then decorate with the stemmed cherries. Serve dip immediately with cookies for dipping. 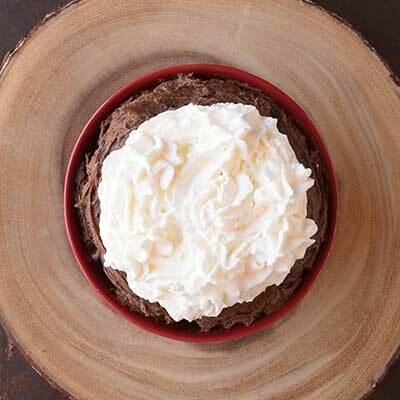 Chocolate cake dip recipe from Crazy for Crust. This dip looks so delicious! Pass me the cookies!